Navy Capt. Robert Geis admitted to being envious of the Tidewater Community College graduates seated in front of him. The 26 transitioning military members, the third cohort of the college’s Solar Ready Vets program, had just completed an intensive five-week training session connecting them to one of the hottest new career fields: solar energy. “There was nothing like this 29 years ago when I joined the Navy,” said Geis, chief of staff for Navy Region Mid-Atlantic. The solar energy field expects to add 36,000 full-time people every year for the next six to eight years. The industry currently employs more than 174,000 professionals nationwide. Opportunities for professional advancement and entrepreneurial success are abundant. 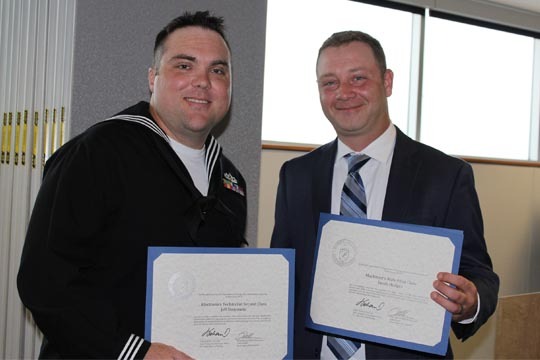 TCC partnered with the U.S. Department of Energy and Navy Region Mid-Atlantic for the free pilot program that guaranteed sailors would have employment interviews with up to five solar companies during the training period. The college offered three cohorts, the first beginning last August. A total of 64 transitioning military members completed the program at TCC, many of whom have already lined up jobs following their discharge. Classes taught at the college’s Chesapeake Campus combined theory with hands-on instruction. Participants in Solar Ready Vets learned how to size and install solar energy systems, connect electricity to a grid and interpret and comply with local building codes for potential careers as installers, designers, project managers and other technical positions. Program participants complete the North American Board of Certified Industry Professionals Entry Level Certification Exam. Participants in the programs are largely Navy sailors within 120 days of separation from the military. “This was a fantastic program, above and beyond what I expected,” said graduate Jonathan Porter, a second class petty officer looking to relocate to Texas. More Solar Ready Vets training sessions at TCC are anticipated, as the program is looking to expand in 2016. For information, contact Chris Blow at TCC’s Center for Military and Veterans Education at 757-822-7725 or cblow@tcc.edu. TCC recognizes the passing of Thomas Moss Jr.